TeamMates Mentoring cordially invites you to experience an exciting European Tower Hunt with the Huskers at Oak Creek Sporting Club near Brainard, NE, on Saturday, March 9th, 2019. 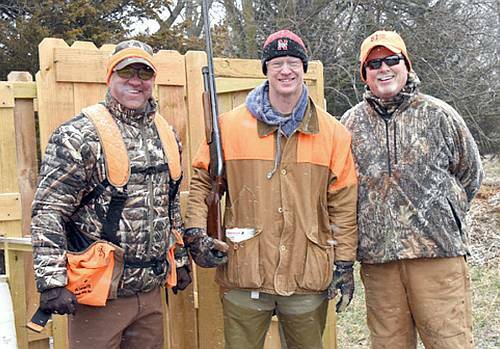 Reserve your spot for Oak Creek’s annual HUNT WITH THE HUSKERS, where you’ll spend your time hunting with former Husker greats. Guns and ammo are available in the Pro Shop. Get ready for plenty of birds! Shooters, please arrive by 10:30 a.m. The hunt program starts approx. 11:15 a.m. Luncheon and program following the hunt – approximately 1 p.m.
Coach Scott Frost, Matt Davison and other former Husker greats will be attending! Instructional & safety meeting before the hunt. Format: European Tower Hunt. Hundreds of birds released. A fabulous lunch and program! A great, fun event with many picture opportunities. Please … no autographs during the event. 100% of the proceeds help TEAMMATES MENTORING, celebrating 27 years of mentoring youth!